When I think about my life this is the one thing that I can't seem to master along with communication skills. When placed in a situatuation I feel uncomfortable with I go into a shell but that's a whole other topic in itself. 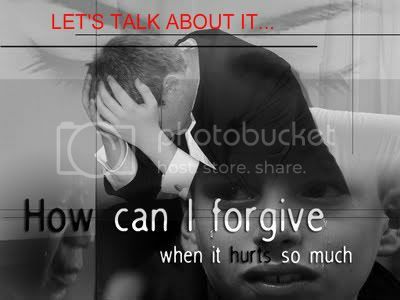 FORGIVENESS <<<<< Haunts me feels like it at times. I feel as if I am unable to forgive ppl who have done me wrong or attempted to atleast. I hold anger and in some cases hate in my heart. I am really trying but I have no idea where to start. Am I the only one facing this problem I am eager to know and if you have faced these issued how do/did you get threw them? My Mother is pastor and she reminded me of a vital scripture in the bible. Colossians 3:13 - Bear with each other and forgive whatever grievances you may have against one another. Forgive as the Lord forgave you. I need a LOT of forgiveness and God forgives willing and freely boy how I wish I was like him. Philippians 1:6- And I am certain that God, who began the good work within you, will continue his work until it is finally finished on the day when Christ Jesus returns. Matthew 18:21-22 -Then Peter came to Jesus and asked, "Lord, how many times shall I forgive my brother when he sins against me? Up to seven times?" Jesus answered, "I tell you, not seven times, but seventy-seven times. What if the person we need to forgive is not a believer? Luke 6:37 -Do not judge, and you will not be judged. Do not condemn, and you will not be condemned. Forgive, and you will be forgiven. Matthew 6:14-16 -For if you forgive men when they sin against you, your heavenly Father will also forgive you. But if you do not forgive men their sins, your Father will not forgive your sins. Mark 11:25 -And when you stand praying, if you hold anything against anyone, forgive him, so that your Father in heaven may forgive you your sins. In this entry I think you have chanelled me-lol. I am the same way. What sign are you? Not that it matters I think, but I am a pisces and I have read my signs characteristics and I have a lot of emotions. And I carry them all out with immense passion. I think that the anger comes from you knowing that you are a good person and that that other person took advatange of those kind gestures. I too am trying to figure out a way to relax and not take everything to heart. Those scriptures you chose were great.